If I hadn’t seen these things with my own eyes, I wouldn’t believe pictures of cars actually existed — in the real world — for everyone to see and have a good laugh. I’m so glad I had my camera! I was in the right place at the right time to capture these one-of-a-kind moments for your enjoyment. We saw this guy from Maine at the Harley-Davidson store in Columbia, TN. 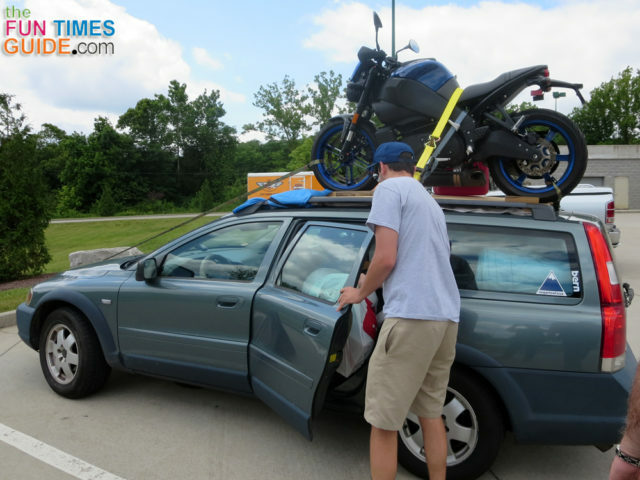 He stopped there looking for a part to make his cross-country trip with a motorcycle on the roof of his car even more enjoyable. He wasn’t very comfortable with all the attention (since everyone was coming outside to see the motorcycle on the car roof) and he appeared to be in quite a hurry to get in and out of the store quickly. When we asked how he got the motorcycle up there, he said his roommates weren’t too happy that he rode it through the front door of his apartment, through the living room, and onto the back porch — which was high enough to match the height of the car’s roof. Best part? He wasn’t exactly sure how he was going to get the motorcycle off the roof once he arrived at his destination! I like this Mini Cooper driver’s sense of humor. Notice the sticker in the back window. It says “Actual Size”. Yes, it’s a small car, but it packs a lot of personality! Now that’s fun! UPDATE: I found that you can buy Actual Size stickers online. 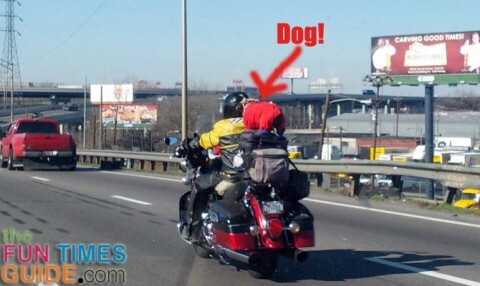 In this photo, you can only see 1 of the 2 dogs that are riding on this motorcycle. You can clearly see both dogs on the motorcycle here. I love riding motorcycles. (We have a Harley.) And I love dogs. (We have a dog.) But this is taking things to a whole new level for me. When we were riding our motorcycle on I-65 in Nashville, we passed this truck a couple of times. Notice the loose dirt and tire riding freely on the truck’s roof! Traffic was going at a steady pace around 55 mph, yet the driver of the truck seemed oblivious of the fact that he had dirt and a tire on his roof. I ride on the road, rather than on sidewalks and trails. I ‘get’ recumbent bicycles and have ridden with many of them on long-distance rides through the years. 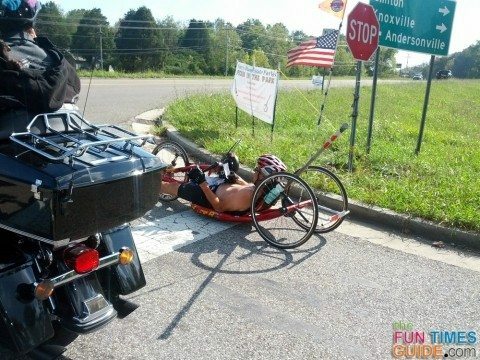 But this low-profile recumbent bike just looks dangerous. It’s dangerous mostly because it’s so difficult to see. Oncoming cars and other traffic (like the motorcycles we were on) would have to make a point to look way down — far below your normal line of sight while driving — just to look for this guy! I’ve shared this one before under Creative Uses For Doilies. But since it’s car-related, I’m sharing it here as well. 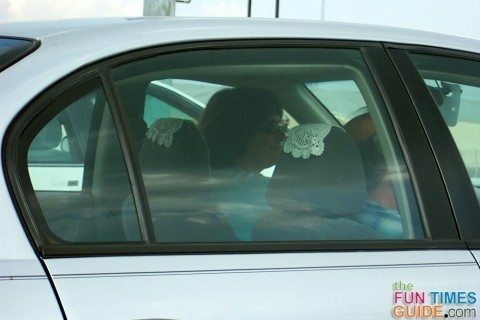 Because there’s nothing more fashionable and modern than a freshly made doily on each headrest in your car, right? 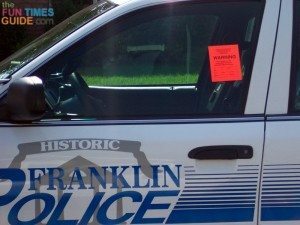 You’ve seen them before… those bright orange (or green) stickers placed on the windows of broken down or otherwise abandoned vehicles on the road. But I had never seen one placed on the window of an official government vehicle before… until now. I just think it’s pretty funny to see someone ‘in authority’ who’s doing it wrong! #8 – Do You Know Where Your Flip Flops Are? Whether you wear flip flops while driving is one thing. But how you choose to carry your flip flops while you’re driving is another thing. This driver finds it convenient to keep his flip flops handy at all times by draping them over the trailer hitch on the rear of the vehicle… while driving. I just hope those flip flops are there the next time he goes looking for them. It was a rainy day in Nashville. It was the afternoon rush-hour after a busy work day. But that didn’t stop this guy from using his car as a trailer to get his new hot water heater home. 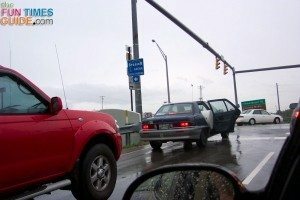 That in itself is no big deal, but the fact that the door wouldn’t close — while driving — is a big deal. 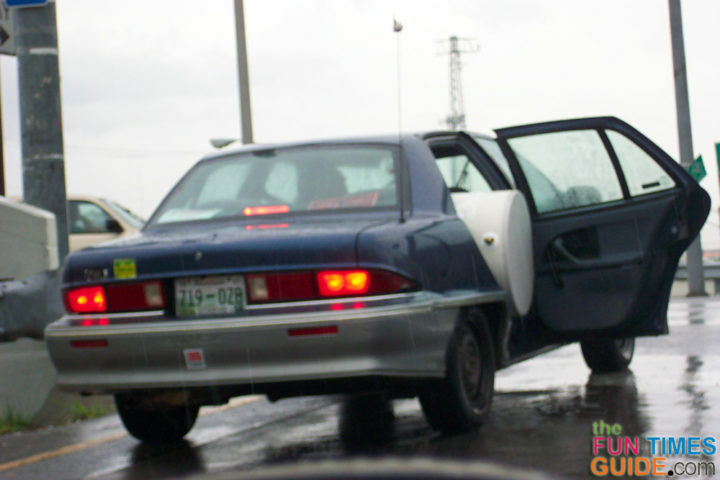 The car door had to remain wide open while driving through narrow lanes of traffic in order to accommodate the extra-long water heater. This is how the mailman delivered mail in my neighborhood during the holidays a few years ago. In the evening (kudos for working late). In his private truck. With wrapped presents and other mail in the back of the truck (uncovered, and unprotected). And the wind was blowing. Needless to say, it didn’t go well. 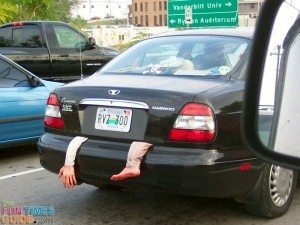 Sure, we’ve all seen these types of ‘dead body in the trunk’ pranks with a fake arm and/or a fake leg hanging out of the trunk. Usually it’s around Halloween time. Right? Well, it wasn’t Halloween when I saw this. I could tell that a number of other drivers (including myself) were caught off-guard when we first saw this during rush hour traffic in Nashville. On second glance, it’s funny. But on first glance, it was a little shocking. We ride our motorcycle past Spencer Auto Sale in Spencer, TN all the time. So this Mercedes with ginormous wheels is a familiar site to us now. But it was quite an eye-catching sight the first time we noticed it! This one’s been a longtime favorite of mine. 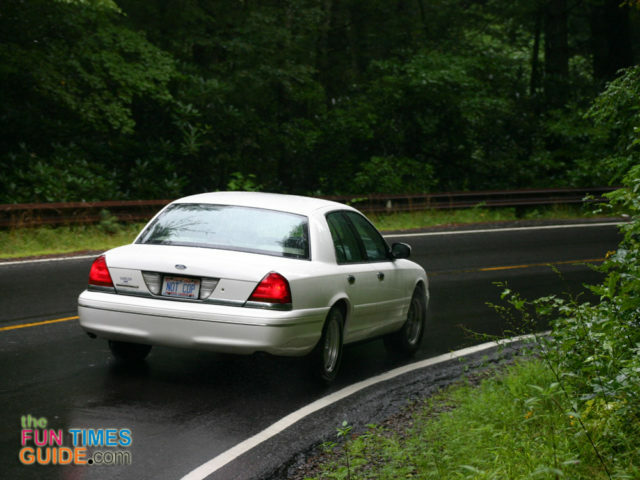 I saw this car when we were riding through the Smoky Mountains near Gatlinburg, TN. Judging by the license plate (Not Cop) on this very basic looking cop car, apparently lots of other people do too. I find it humorous that this driver aims to put your fears to rest by assuring you — via his personalized license plate — that he’s not a cop. I wonder if there’s one on the front too? I’ve been seeing more and more oversize loads like this — most of which I’ve documented before. But there’s still something about the sheer size of the world’s largest inanimate objects that fascinates me to no end. 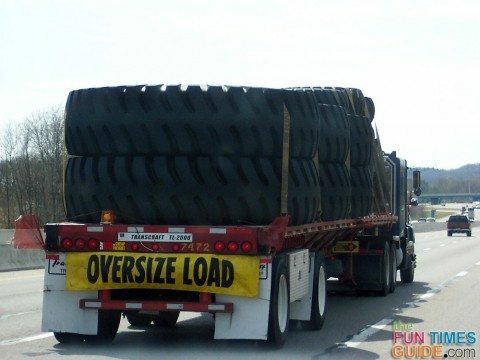 In this case, it’s hard to imagine what could possibly be so big to require such massive tires. #15 – I Love Volkswagens! You’ve gotta love this VW bus pulling a cut-off VW Beetle that’s being used as a VW trailer! I saw this while we were passing a convoy of Volkswagen vehicles on their way to some fun VW event. If you, too, love Volkswagens then you’ll love these VW boards on Pinterest! We have lots more Strange & Funny Things and an awesome Funny Photos of Cars & Crazy Drivers Pinterest Board with even more funny pictures of cars and crazy drivers from around the web.